Esra, do you think it is possible to speak about off-season in armwrestling? 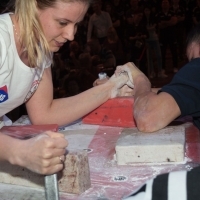 – I think armwrestling can't be talked about outside of the season. Because I'm doing my training to ensure strength and development during the year rather than off-season. How do you think what is the difference between off-season and preparation period? – The only difference is that at the out-of-season athlete has more idle training without competitions. The competition period is the most challenging period for the athlete. Try to summit the form at the same time should pay more attention to nourishment. Do you have such a period of time that could be called as off-season? – Off-season is when I do not have competitions for me. And at this point I continue my usual training. How do you go out of the off-season to preparation? Do you give your usual load in one moment or step by step? – The weights I use during the off-season training sessions are moderate. Increasing with time to prepare for the competition season. So, step by step! How are your workouts in the out-of-competition? For what competition do you prepare now? – I make very small changes in my training out-of-season, which are to improve the missing aspects better. More dynamic weighted work. As the competition comes closer, the load increases. So I do more static workout to increase power, endurance. I already practice regularly. For the European and world championships, I need 3 months to summit my form with tight and strong workouts. I am going to participate in the Turkish championship which will be held in Antalya on 14-18 March. I am preparing for the European and World Championships, not for this competition, as my goals are great. I wish all the sportsmen and referees who will participate in the competition to be successful. Vazgen Soghoyan: "I'm going to win for the third time!"